Unresolved ER stress followed by cell death is recognized as the main cause of a multitude of pathologies including neonatal diabetes. 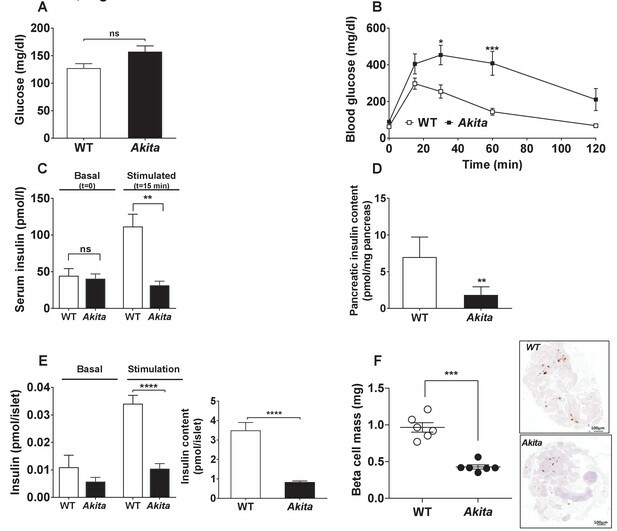 A systematic analysis of the mechanisms of β-cell loss and dysfunction in Akita mice, in which a mutation in the proinsulin gene causes a severe form of permanent neonatal diabetes, showed no increase in β-cell apoptosis throughout life. Surprisingly, we found that the main mechanism leading to β-cell dysfunction is marked impairment of β-cell growth during the early postnatal life due to transient inhibition of mTORC1, which governs postnatal β-cell growth and differentiation. Importantly, restoration of mTORC1 activity in neonate β-cells was sufficient to rescue postnatal β-cell growth, and to improve diabetes. We propose a scenario for the development of permanent neonatal diabetes, possibly also common forms of diabetes, where early-life events inducing ER stress affect β-cell mass expansion due to mTOR inhibition. Insulin is a hormone that is crucial for maintaining normal blood sugar levels and is produced by so called β-cells in the pancreas. If the body stops making insulin, or cells stop responding to it, blood sugar levels rise, leading to diabetes. A form of diabetes known as type 1 diabetes, where the body stops making insulin, usually starts in childhood and can sometimes appear during the first six months of life. Infants affected by this early onset of diabetes have mutations in one copy of the gene that encodes insulin. They can still produce half of the amount of insulin, which should be sufficient to control blood sugar to a certain extent. Instead, insulin production stops almost completely after a few months. Scientists believe that this is because the mutant insulin has a toxic effect on β-cells. Mutations in the insulin gene affect the structure of insulin. As a result, insulin builds up in the β-cells, which may eventually cause the cells to die. But the mutant insulin might also cause a problem with a molecule called mTORC1, which helps β-cells to grow. To investigate this further, Riahi et al. used a mouse model of this form of diabetes to study how stress affects β-cells from birth to adulthood. Mutant β-cells slowed down their rate of cell growth and division early after birth, but did not die more frequently. The results also revealed that β-cells had lower levels of mTORC1, which probably is the main cause of the reduced cell division and growth. When mTORC1 levels were boosted experimentally, the β-cells started to grow and produce more insulin. Understanding β-cell biology and the link between stress and growth, especially early in life, is a key step in understanding diabetes. In a separate study, Balboa et al. found that human β-cells with insulin mutations also had low mTORC1 and struggled to grow. If boosting mTORC1 could rescue β-cell growth in humans, it could lead to new ways to prevent diabetes. β-Cell failure is the fundamental pathophysiological factor of both type 1 (T1D) and type 2 diabetes (T2D) (Cerasi and Luft, 1967; Accili et al., 2010; Rhodes, 2005; Mathis et al., 2001). There also exist less frequent, monogenic forms of diabetes resulting from loss-of-function mutations in β-cell function genes. An example is proinsulin mutations which lead to proinsulin misfolding, inducing β-cell ER stress and consequently permanent neonatal diabetes, also called mutant-insulin diabetes of the young (MIDY); its animal counterpart is the Akita mouse (Liu et al., 2010; Weiss, 2013). β-Cells have a highly developed endoplasmic reticulum (ER) to cope with the demand to secrete high amounts of insulin. In diabetes, the proinsulin burden on the ER is increased and proinsulin folding is impaired due to altered β-cell redox state, hence leading to accumulation of misfolded proinsulin and consequently to ER stress. Therefore, proinsulin misfolding/ER stress also plays an important role in the pathophysiology of T1D and T2D (Eizirik et al., 2008; Scheuner and Kaufman, 2008). Clarifying how ER stress leads to β-cell failure in Akita diabetes can have important implications for the common forms of diabetes. β-Cell mass is reduced in diabetes (Rahier et al., 2008; Butler et al., 2003), albeit with very large variation between subjects, even in T1D (Campbell-Thompson et al., 2016). Several mechanisms are implicated, including impaired programming of the endocrine pancreas in utero (Sandovici et al., 2013; Alejandro et al., 2014), increased β-cell apoptosis (Butler et al., 2003; Jurgens et al., 2011; Donath et al., 1999), reduced β-cell proliferation (Butler et al., 2007), and dedifferentiation of mature β-cells (Talchai et al., 2012). The quantitative contribution of the different mechanisms to β-cell loss in diabetes is controversial. More important, it is uncertain whether β-cell loss precedes the onset of diabetes or develops during later stages of the disease secondary to hyperglycemia, and thus can rather be viewed as a complication of diabetes. β-Cell mass expands rapidly in the newborn and then adjusts to changes in metabolic demand, probably also in humans (Bonner-Weir et al., 2016; Cigliola et al., 2016). In mice, islet and β-cell numbers are increased more than 3-fold between 10 days of age and adulthood; this is associated with high β-cell replication, which is drastically decreased during adulthood (Herbach et al., 2011; Teta et al., 2005; Saisho et al., 2013). β-Cell mass expansion is mainly mediated via proliferation of mature β-cells (Dor et al., 2004). It has been recently suggested that insulin demand drives β-cell proliferation via the unfolded protein response (UPR), which senses insulin production. UPR activation during ER stress correlated with and triggered β-cell proliferation in response to glucose, probably through ATF6 (24). Others showed that reducing the proinsulin load by deleting the insulin gene decreased UPR along with increased β-cell proliferation (Szabat et al., 2016), suggesting that ER stress is implicated in the regulation of β-cell proliferation. Herein, we exploited the Akita mouse model of diabetes to study how ER stress affects β-cell mass expansion and differentiation during early life. We found that exposure to ER stress during the neonatal period dramatically reduces β-cell growth and functional maturation. This was associated with transient inhibition of the key signaling complex mTORC1 which governs postnatal β-cell growth and differentiation. Impairment of early β-cell growth and maturation leads to permanent β-cell dysfunction with subsequent development of diabetes; restoration of mTORC1 activity in Akita neonates was sufficient to prevent β-cell loss and ameliorate diabetes. Metabolic state and islet morphometry were analyzed in 2- to 3-month-old Akita mice. Adult Akita mice develop severe insulin-deficient diabetes with fed blood glucose ~ 400 mg/dl along with a 90% decrease of pancreatic insulin content (Figure 1—figure supplement 1a–c). In adult Akita mice, β-cell mass was decreased by 70% compared to age-matched controls (Figure 1a). We studied whether decreased β-cell mass is mediated via impaired β-cell proliferation, increased apoptosis or dedifferentiation. The rate of β-cell proliferation measured by Ki67 staining was < 1% and similar in control and Akita mice (Figure 1b). In agreement with a previous study (Izumi et al., 2003), there was a slight increase in the number of TUNEL+ β-cells in Akita mice (Figure 1b). Most islets contained no or only a single TUNEL+ β-cell. We counted 2592 β-cells in wild type and 1754 cells in Akita mice and found that the frequency of TUNEL+ cells was 0.1% in Akita mice, whereas no TUNEL+ cells were observed in control mice; the difference between groups was not statistically significant (p=0.1). Thus, the frequency of apoptotic events based on TUNEL was fairly low in Akita β-cells. Apoptotic cells are rapidly cleared by macrophages; therefore, the true rate of apoptosis is very difficult to assess in all models of diabetes. We cannot exclude that cumulative low-grade apoptosis throughout life contributes to β-cell loss in adult animals; however, this finding was somewhat surprising, considering the fact that irreparable proinsulin misfolding generates severe ER stress associated with β-cell loss and insulin deficiency mimicking T1D. β-Cell mass, turnover and differentiation in adult Akita mice. Analyses were performed on 2- to 3-month-old Akita mice and age-matched controls. (a) β-cell mass (n = 6 in each group); (b) β-cell proliferation and apoptosis assessed by staining for insulin and Ki67 (n = 6–7 mice in each group; a total of 4909 wild type (WT) and 2523 Akita β-cells were quantified) or TUNEL (n = 4–5 mice in each group; 2592 WT and 1754 Akita β-cells). The percentage of Ki67+ and TUNEL+β-cells is shown in the table above; (c–d) β-cell differentiation was assessed by lineage tracing. Wild-type and Akita mice were crossed with RIP-Cre:Rosa26-Yfp reporter mice; (c) pancreatic sections of Akita mice were immunostained for insulin and somatostatin or glucagon. Lineage-traced β-cells (YFP+) expressing somatostatin or glucagon is shown in squares and zoomed in; (d) quantification of insulin-expressing β-cells (percentage of insulin+/YFP+ cells), insulin-degranulated β-cells (percentage of insulin-/YFP+ cells) and of cells with misexpression of somatostatin or glucagon (percentage of somatostatin+ or glucagon+/YFP+ cells) in WT and Akita mice is shown; *p<0.05. Next, we studied by lineage tracing whether β-cell loss results from β-cell degranulation or trans-differentiation. We generated RIP-Cre:Rosa26-Yfp reporter mice on the background of wild-type and Akita mice, in order to monitor the fate of β-cells in adult animals. We stained pancreatic sections of β-cell reporter mice for insulin, glucagon and somatostatin and quantified the percentage of genetically labeled β-cells (YFP+) expressing insulin or non-β-cell hormones (Figure 1c). In Akita mice, the number of genetically labeled β-cells that stained negative for insulin (INS) increased by 2.6-fold compared with wild-type mice (Figure 1d). Part of the YFP+/INS- cells expressed glucagon or somatostatin (0.3% of YFP+/INS- cells; 9 out of 3233 cells) in Akita compared to 0.04% in controls; 3 out of 8091 cells). The percentage of β-cells expressing transcription factors required for β-cell maturation and function, including PDX-1 and NKX6.1, was decreased in Akita mice (Figure 1—figure supplement 2). These findings suggest that some degree of β-cell dedifferentiation/reprogramming does take place in diabetic Akita mice; nevertheless, 98.7% of genetically labeled Akita β-cells remained insulin positive (Figure 1d); therefore, these alterations could not explain the 70% decrease in β-cell mass. Collectively, decreased β-cell mass in diabetic Akita mice is not due to alterations in β-cell proliferation, survival or differentiation in adulthood. We therefore assessed β-cell dynamics during the early postnatal period. Developmental insults during gestation, such as malnutrition, low-protein diet and increased exposure to glucocorticoids, are known to restrict the number of β-cells formed in the fetal pancreas, which is maintained in adulthood (Alejandro et al., 2014; Dumortier et al., 2011; Garofano et al., 1998). We envisioned that proinsulin misfolding in the embryo after the initiation of insulin biosynthesis at day E11 might lead to ER stress with subsequent impairment of β-cell growth in utero. We analyzed β-cell mass, proliferation and apoptosis in Akita and control newborns at P1-2. At this stage, Akita mice have normal body and pancreatic weight (Figure 2a–b) and are strictly normoglycemic (Figure 2c). β-Cell mass in Akita newborns was similar to that in control mice (Figure 2d). Furthermore, β-cell proliferation was approximately 8-fold higher than in adult animals and was similar in Akita and control mice (Figure 2e); TUNEL+ β-cells were found neither in control nor in Akita mice (n = 2592 control and 1754 Akita β-cells were counted). In Akita mice, the percentage of NKX6.1 expressing β-cells was similar to that in control mice, whereas there was a small decrease in the percentage of PDX-1 expressing β-cells (Figure 2f–g). Dynamic changes of body and pancreas growth and glycemia, β-cell mass, proliferation and differentiation in Akita and control mice at P1-2. (a) body weight, (b) pancreas weight of wild-type and Akita mice at P1-2, P19-21 and at the age of 2–3 months. (a) P1-2: WT (n = 8); Akita mice (n = 4), P19-21: WT (n = 21); Akita mice (n = 23), 2–3 months: WT (n = 33); Akita mice (n = 39); (b) P1-2: WT (n = 8); Akita mice (n = 4), P19-21: n = 14 in each group, 2–3 months: n = 17 mice in each group). (c) fed blood glucose (n = 7–8 mice in each group); (d) β-cell mass (n = 5 mice in each group); (e) β-cell proliferation assessed by immunostaining for insulin and Ki67 (n = 4 mice in each group; 1886 WT and 1483 Akita β-cells). The percentage of Ki67+ β-cells is shown in the table above; (f–g) quantification of β-cells (insulin+) expressing NKX6.1 (n = 3–4 mice in each group; 1148 WT and 1808 Akita β-cells) and PDX-1 (n = 3–5 mice in each group; 1364 WT and 1507 Akita β-cells). *p<0.05, ****p<0.0001. 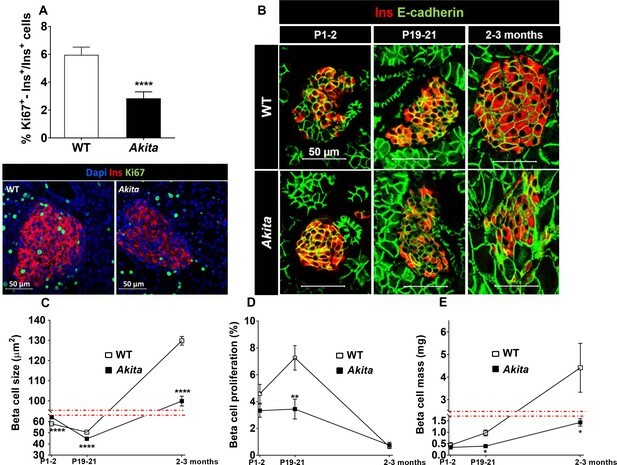 Altogether, these findings indicate that in uteroβ-cell development in Akita mice is only minimally impaired, and that β-cell loss must occur after birth. We then hypothesized that ER stress might impair β-cell growth during the postnatal period prior to development of diabetes. To test this hypothesis, we assessed the metabolic state and β-cell mass in Akita compared to control mice at P19-21, prior to weaning. At this stage, body weight and fed and fasting blood glucose in Akita mice were still normal (Figures 2a and 3a–b); however, the mice exhibited marked β-cell dysfunction, evident by glucose intolerance associated with blunt insulin response to glucose and decreased pancreatic insulin content (Figure 3b–d). Islets isolated from pre-diabetic Akita mice also showed marked attenuation of glucose-stimulated insulin secretion along with reduced insulin content (Figure 3e). β-Cell mass was decreased by 60% compared to controls, which is similar to the relative decrease in β-cell mass in adult mice (Figure 3f). This was accompanied by a parallel decrease in β-cell proliferation based on Ki67, PCNA and phospho-Histone-H3 immunostaining (Figure 4a and Figure 4—figure supplement 1a). In control mice, β-cell proliferation remained high in the first 3 weeks of life; this was accompanied by two-fold increase in β-cell mass (Figure 4d–e). The decline in β-cell proliferation in Akita mice completely prevented the expected early increase of β-cell mass (Figure 4e). The proliferation rate in the exocrine tissue was similar in wild type mice and in Akita mice (Figure 4—figure supplement 1b), indicating that the effect of the Akita mutation on proliferation is cell autonomous. Consistently, the weight of the pancreas, which mainly contains exocrine tissue, was similar in Akita and control mice (Figure 2b). To assess β-cell size, we used insulin staining to mark β-cells and E-cadherin to highlight cell boundaries (Figure 4b–c). In control mice, β-cell size remained unchanged during the first 3 weeks of life and increased 3-fold in adult animals. In Akita mice, β-cell size decreased during the early postnatal period, but increased after weaning while developing diabetes. Akita β-cells were smaller than control at P1-2, P19-21 and in 2- to 3-month old animals: a 33% reduction in β-cell size was observed in adult Akita mice (Figure 4b–c). Notably, β-cell mass increased after weaning both in wild type and in Akita mice (Figure 4e); however, the overall increase in β-cell mass in Akita mice was attenuated compared to controls due to the lower rate of β-cell proliferation and smaller increase in β-cell size. We did not detect any TUNEL+ β-cells at P19-21, neither in control nor in Akita mice (n = 2676 control and 1447 Akita β-cells were counted), indicating that apoptotic events were quite rare even in Akita mice. Metabolic state, β-cell function and mass in pre-weaning (P19-21) Akita mice and age-matched controls. (a) fed blood glucose (n = 7 in each group); (b) IPGTT- glucose (1.5 g/kg) was injected intraperitoneally after an overnight fast (n = 5 in each group); (c) glucose-stimulated insulin secretion in vivo. Insulin was measured before and 15 min following IP glucose injection (1.5 g/kg); (d) pancreatic insulin content (n = 4–5 in each group); (e) basal (3.3 mmol/l glucose) and stimulated (16.7 mmol/l glucose) insulin secretion and insulin content of Akita and control islets analyzed by static incubations. Islets were divided into 4 batches of 25 islets per group (n = 3); (f) β-cell mass (n = 6 mice in each group). *p<0.05, **p<0.01, ***p<0.001, ****p<0.0001. Dynamic changes in β-cell expansion in Akita and control mice. (a) β-cell proliferation assessed by immunostaining for insulin and Ki67 (n = 6 mice in each group; 2541 WT and 3391 Akita β−cells); (b) β-cell size at P1-2 (newborn, n = 4–5 mice in each group; 334 WT and 435 Akita β-cells), P19-21 (pre-weaning, n = 3 mice in each group; 330 WT and 364 Akita β−cells) and in adult mice (2–3 month-old, n = 3 mice in each group; 266 WT and 417 Akita β−cells) assessed by immunostaining for E-cadherin and insulin. Quantifications of β-cell size (c), proliferation (d), and mass (e) are shown. *p<0.05, **p<0.01, ****p<0.0001. In summary, Akita β-cell mass is decreased due to impaired postnatal β-cell growth early in life, prior to the onset of full-blown diabetes. To understand the mechanisms underlying Akita β-cell growth arrest and dysfunction prior to development of diabetes, we isolated islets from pre-weaning mice at P19-21, and analyzed gene expression by RNA-seq. It has been previously reported that in heterozygous Akita mice β-cell loss is accompanied by decreased α-cell number and that islet composition remained unchanged (Kayo and Koizumi, 1998). Consistently, we found that β-cell number per islet area and β/α cell ratio were similar in neonate Akita and wild-type mice (Figure 5—figure supplement 1), indicating that transcriptomic analysis mainly reflects the changes in the genetic signature of the β-cells (~70% of all islet cells) and is not influenced by alterations in islet composition. The list of differentially expressed genes between Akita and control islets is shown in Table 1. We performed geneset enrichment and pathway analyses using Genomica and Ingenuity software. ER-stress-related genes were upregulated in Akita islets, along with modest enrichment of genes involved in apoptosis (Figure 5a). Intriguingly, total steady state mRNA levels of Xbp1, the main ER stress-sensing transcription factor, were decreased with only a modest increase in Xbp1 splicing (Figure 5b). The most prominent upregulated UPR gene was Homocysteine-responsive endoplasmic reticulum-resident ubiquitin-like domain member one protein (Herpud1) (log 2FC 1.8; p=4.6×10−24). HERPUD1 functions as a hub for membrane association of ER associated degradation (ERAD) machinery components and for the interactions between misfolded proteins and ERAD. The expression of chaperones, including Dnajc3 (Hsp40), Manf and Hspa5 (Bip) was upregulated in Akita islets (Figure 5b); the protein level of the latter was also markedly increased (Figure 6a). There was a mixed response of genes that regulate apoptosis in ER stress: Atf6, Atf3, Ddit3 (Chop), Txnip and Bbc3 (Puma) were upregulated, whereas Atf4 and pro-apoptotic Bax were downregulated (the changes in Atf3, Atf4, Atf6 and Bax were not statistically significant) (Figure 5b). P85α is a regulatory unit of PI3 kinase; it has been shown that P85α deficiency protects β-cells from ER-stress-induced apoptosis (Winnay et al., 2014). In Akita islets, the expression of Pik3r1 gene encoding for P85α was decreased (Figure 5b), probably promoting β-cell survival. It has been previously shown that in Akita mice ER stress-induced apoptosis is mediated via CHOP; however, CHOP expression was increased only after development of diabetes, but not during the neonatal period (Oyadomari et al., 2002), further suggesting that young β-cells adapt to chronic ER stress without robust stimulation of the terminal, pro-apoptotic UPR. Transcriptomic analysis of ER stress markers and β-cell gene signature in neonate Akita islets. (a) RNA-seq comparing the transcriptome of islets from P19-21 Akita and age-matched control mice (n = 3 samples in each group, each sample is a pool of islets from three mice). Columns represent pathways that are differentially regulated in Akita mice; (b) expression of UPR and apoptosis genes and of Nkx6.1 and Pdx1 in islets of Akita compared to control mice at P19-21. Spliced and total Xbp1 were also quantified by qPCR. The spliced/total Xbp1 ratio is shown beside (n = 3); (c–d) heat map of genes regulated by NKX6.1 (c) and PDX-1 (d) in Akita islets and controls. *p<0.05, **p<0.01, ***p<0.001, ****p<0.0001. Effects of ER stress on the expression of β-cell transcription factors in neonate Akita islets (P19-21) and islets treated with thapsigargin. (a) PDX-1 and BiP protein level analyzed by Western blotting (n = 3, each sample is a pool of islets from four to six mice); (b) quantification of NKX6.1 (n = 3 mice in each group; 1646 WT and 728 Akita β−cells), and PDX-1 (n = 3 mice in each group; 1534 WT and 844 Akita β−cells) expressing β-cells. Pancreatic sections were immunostained for NKX6.1 or PDX-1 and insulin. The percentage of NKX6.1- and PDX-1-positive β-cells is shown. (c) Islets from young (P19-21) and adult wild-type mice were treated with low-dose thapsigargin (50 nmol/l) and TUDCA (250 µmol/l) or PBA (2.5 mmol/l) for 48 hr with daily media changes and further analyzed by western blotting for PDX-1 and BiP (n = 3, each sample is a pool of islets from six to nine mice); (d) INS-1E cells were treated with 20 nmol/l thapsigargin for 24 and 48 hr followed by western blotting for PDX-1. **p<0.01, ***p<0.001, ****p<0.0001. Transcriptome changes in P19-21 Akita islets compared to age-matched controls (n = 3 per each group). Strikingly, we found that genes regulating β-cell differentiation and function were downregulated in pre-weaning, neonate Akita islets (Figure 5c–d and Table 1). This included the transcription factors Nkx6.1, Nkx2.2 and Mafa, proinsulin (Ins1 and Ins2), pancreatic convertase 1/3 (Pcsk1) and Glut2 (Slc2a2), as well as genes involved in calcium signaling, insulin granule formation and secretion (Table 1). 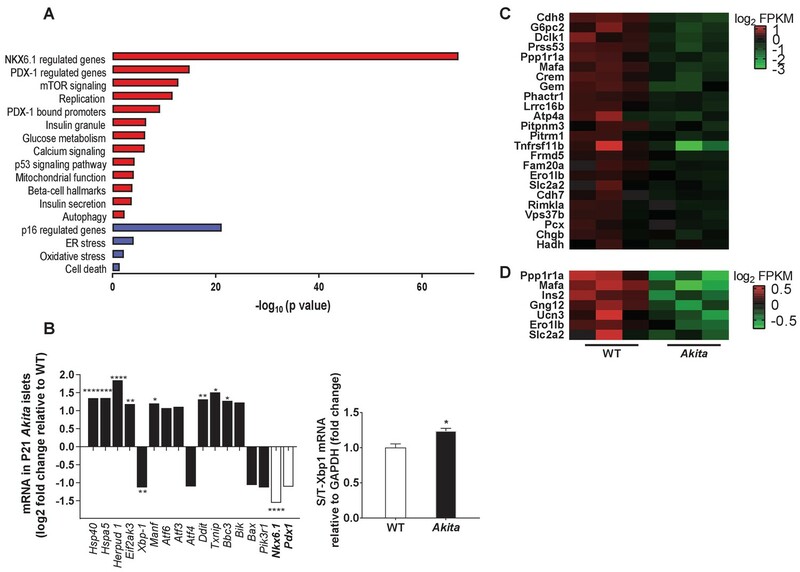 Consistently, target genes of NKX6.1 and PDX-1 transcription factors, master regulators of β-cell differentiation and function, were also downregulated, suggesting impairment of β-cell differentiation (Figure 5c–d). RNA-seq showed that in Akita neonates, the mRNA level of Pdx1 was not significantly downregulated (Figure 5b), whereas PDX-1 protein level was markedly reduced (Figure 6a). Immunostaining showed that the number of β-cells expressing NKX6.1 and PDX-1 was decreased by ~50% (Figure 6b), indicating that the lower expression of β-cell transcription factors is not due to decreased β-cell number per se. Finally, we treated adult and neonate islets and the β-cell line INS-1E with low-dose thapsigargin; this decreased PDX-1 protein level (Figure 6c–d). Chemical chaperones (TUDCA and 4-PBA) had variable effects on BiP expression; however, both compounds failed to prevent the effect of ER stress on PDX-1 expression (Figure 6c). Mitochondrial activity has been implicated in cell proliferation including that of β-cells (Walter et al., 2015; Klochendler et al., 2016) and is instrumental for β-cell functional maturation and for the development of mitogenic and secretory responses to glucose (Stolovich-Rain et al., 2015). Several genes encoding subunits of the electron transport chain including Ndufs2, Sdhc, Cox6a2, Cox6c, as well as the key anaplerotic enzyme pyruvate carboxylase (Pcx) were downregulated in neonate Akita islets. On the contrary, the expression of pyruvate dehydrogenase kinases (Pdk1, 2 and 4), which inhibit oxidative phosphorylation by phosphorylating pyruvate dehydrogenase, was upregulated (Table 1). In summary, ER stress leads to decreased expression of key β-cell transcription factors and mitochondrial genes along with impaired postnatal β-cell differentiation and functional maturation. Consistent with abrogated β-cell growth, the expression of proliferation and cell cycle genes was reduced in pre-weaning Akita neonates (Table 1). It has been reported that insulin-like growth factor 1 and 2 (IGF1 and IGF2) and epidermal growth factor (EGF) receptors are necessary for normal β-cell growth and differentiation (Kulkarni et al., 2002; Miettinen et al., 2008). The expression of EGF, IGF1 and IGF2 receptors was indeed decreased in Akita islets, whereas the expression of the insulin receptor remained unchanged (Table 1). Growth factors mediate their effects via IRS proteins with subsequent activation of PI3 kinase and its downstream target AKT. The expression of Pik3r1 encoding for the regulatory unit of PI3 kinase (P85α) was decreased (Figure 5b), along with marked inhibition of AKT activity (Figure 7a). mTORC1 is a protein complex that integrates signals from nutrients, growth factors, hormones and stress to regulate cell growth and proliferation, which is indispensable for embryonic and postnatal β-cell growth and maturation (Ni et al., 2017). Western blotting showed that also mTORC1 activity was markedly inhibited in neonatal Akita islets, evident by decreased protein levels and Ser240/244 phosphorylation of ribosomal S6 (Figure 8a). Eukaryotic translation initiation factor 4E binding protein (4E-BP1) dephosphorylation was reflected in the shift from the highly phosphorylated γ-band to the nonphosphorylated β-band as previously described (Ni et al., 2017) (Figure 8a). Immunostaining showed that the number of phospho-S6+ β-cells was high in newborn β-cells and decreased over time (Figure 8b). On the contrary, mTORC1 activity (S6 phosphorylation) in the exocrine pancreas was low during the neonatal period and was markedly enhanced in adult mice (Figure 8b). 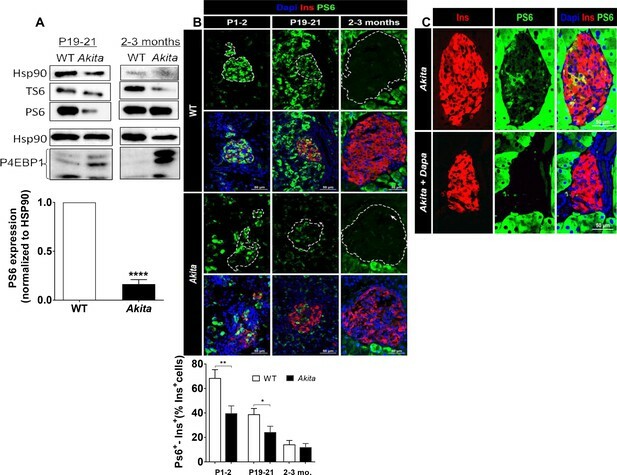 The number of phospho-S6+ β-cells was lower in Akita mice than in controls already at P1-2 and at P19-21, further indicating that mTORC1 activity was decreased in neonate Akita β-cells (Figure 8b). 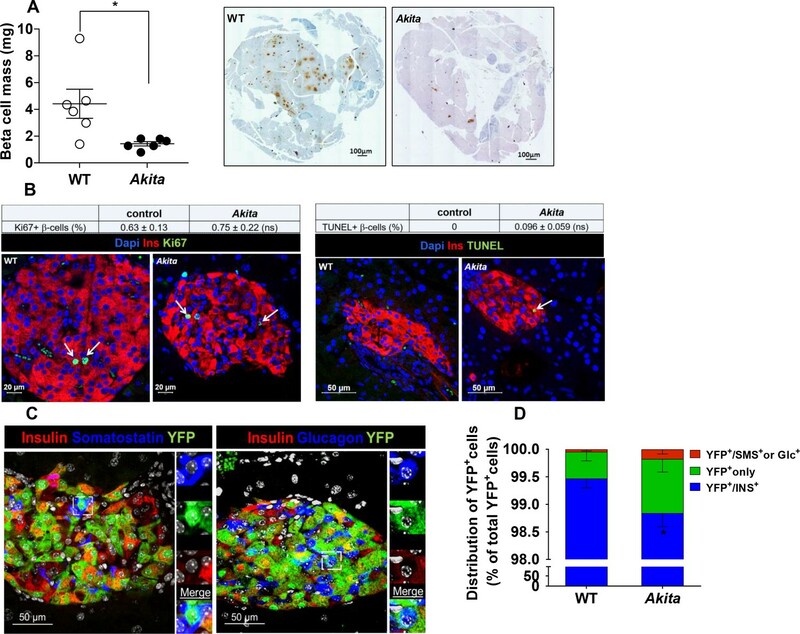 In adult islets the number of S6+ β-cells was small and mTORC1 activity was increased in Akita, despite sustained inhibition of AKT signaling (Figure 8a and 7a). We and others have previously shown that in diabetes hyperglycemia stimulates mTORC1 activity (Fraenkel et al., 2008; Yuan et al., 2017). Treatment of adult Akita mice with the glucosuric drug dapagliflozin for 72 hr decreased blood glucose and abrogated S6 phosphorylation (Figure 8c), indicating that mTORC1 activation in diabetic Akita β-cells is mediated via hyperglycemia. Consistent with the findings in neonate Akita islets, treatment of INS-1E cells with low-dose thapsigargin for 48 hr did not affect IRS2 protein level and inhibited AKT and S6 phosphorylation (Figure 7b–c), suggesting that ER stress inhibits AKT-mTORC1 signaling. We next studied whether treatment with chemical chaperones can prevent the downregulation of mTORC1 and increase β-cell proliferation in Akita neonates. Intriguingly, both TUDCA and PBA further decreased mTORC1 activity in Akita β-cells (Figure 8—figure supplement 1a). In vivo, treatment of Akita neonates with TUDCA for 48 hr decreased β-cell proliferation (Figure 8—figure supplement 1b). Effects of ER stress on IRS2/Akt signaling in Akita islets and in INS-1E treated with low-dose thapsigargin. 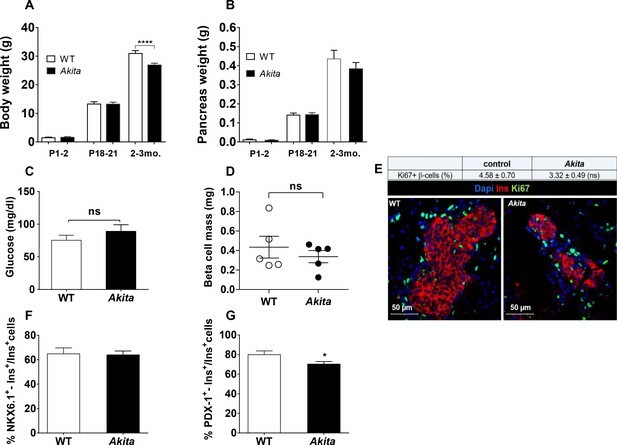 (a) IRS2/Akt signaling in islets from neonate (P19-21) and adult wild-type and Akita mice. Each sample is a pool of islets from 4 to 15 mice (n = 4 for neonate islets and n = 2 for adult islets). (b–c) INS-1E cells were treated with 20 nmol/l thapsigargin for 24 and 48 hr followed by western blotting for IRS2, total and phosphorylated Akt (Ser473 and Thr308) and S6 (Ser240/244). A representative experiment (b) and quantification (c) are shown (n = 4–6). *p<0.05. mTORC1 signaling in neonate and adult Akita islets. (a) Western blot analysis of S6 and 4EBP1 phosphorylation in islets of neonate (P19-21) and adult wild-type and Akita mice. Quantification of phosphorylated S6 in neonate Akita compared to control islets is shown (n = 3, each sample is a pool of islets from 4 to 7 mice); (b) immunostaining for phospho-S6 on pancreatic sections of P1-2, P19-21 and adult Akita mice and age-matched controls and quantifications of the percentage of S6+ β-cells (P1-2: n = 4 mice in each group; 1159 WT and 1655 Akita β−cells; P19-21: n = 6 mice in each group; 2259 WT and 1567 Akita β−cells; adult: n = 4–5 mice in each group; 2391 WT and 1383 Akita β-cells). Islet boundaries are marked by dotted line; (c) adult Akita mice were treated with 25 mg/kg dapagliflozin in drinking water for 72 hr. Blood glucose in dapagliflozin-treated Akita mice was ~ 200 mg/dl compared to ~ 500 mg/dl in control Akita mice. Pancreatic sections were immunostained for insulin and phospho-S6 (n = 3 mice in each group). *p<0.05, **p<0.01, ****p<0.0001. In summary, in Akita islets mTORC1 is inhibited during the neonatal period in parallel to the β-cell growth arrest. Treatment with chemical chaperones failed to correct the early β-cell growth arrest. The TSC1/TSC2 complex is a key negative upstream regulator of mTORC1. Constitutive activation of mTORC1 by Tsc2 knockout in β-cells modulates β-cell mass in a biphasic manner (Bartolomé et al., 2014; Shigeyama et al., 2008). In young mice, constitutive mTORC1 activation increases β-cell number and size, whereas in old mice the animals develop diabetes due to increased β-cell apoptosis. Because ER stress inhibited mTORC1 and β-cell growth in neonates, we studied whether stimulation of mTORC1 could rescue diabetes in Akita mice. We generated heterozygous and homozygous βTsc1 knockout Akita mice (RIP-Cre:Tsc1flox/+:Akita and RIP-Cre:Tsc1flox/flox:Akita mice) by crossing Akita mice with Rosa-26-floxed Tsc1 mice and with RIP-Cre mice. βTsc1+/+, βTsc1+/- and βTsc1-/- mice were used as controls. It has been previously reported that the RIP-Cre alone without recombination at lox sites is associated with glucose intolerance and even frank diabetes (Lee et al., 2006). We found that in wild-type mice, expression of RIP-Cre induced only modest glucose intolerance even in adult mice (Figure 9—figure supplement 1a). 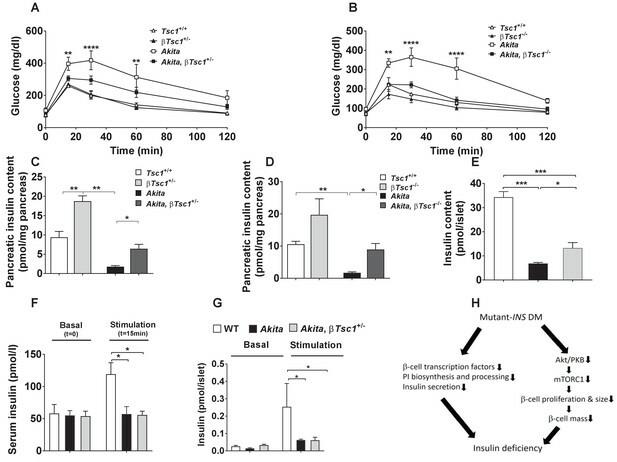 Moreover, it did not affect fed blood glucose either in wild-type or in Akita mice (Figure 9—figure supplement 1b), and the insulin sensitivity of Akita mice was unaltered (Figure 9—figure supplement 1c). We therefore believe that this is a valid model to test the effects of mTORC1 activation on diabetes and β-cell function in Akita mice. We first studied the effect of Tsc1 knockout on mTORC1 activity in neonates at P19-21. In Akita neonates TSC1 deficiency increased mTORC1 activity compared to Akita controls, evident by S6 phosphorylation (Figure 9a). Activation of mTORC1 did not affect the expression of BiP (Figure 9b), suggesting that this did not have a major effect on β-cell ER stress. TSC1 deficiency in Akita mice increased β-cell size (Figure 9c) and proliferation (Figure 9d). At P30-35, mTORC1 activation did not affect β-cell proliferation either in heterozygous or homozygous Tsc1 knockout mice (Figure 9d), indicating that stimulation of mTORC1 induced β-cell proliferation only in young mice prior to weaning. Effects of mTORC1 activation in neonate Akita β-cells on β-cell size and proliferation. Studies were performed on heterozygous and homozygous βTsc1 knockout Akita mice (RIP-Cre:Tsc1flox/+:Akita (Akita, βTsc1+/-) and RIP-Cre:Tsc1flox/flox:Akita (Akita, βTsc1-/-). Tsc1flox/+:Akita and Tsc1flox/flox:Akita were used as Akita controls. RIP-Cre:Tsc1flox/+ mice (βTsc1+/-) and RIP-Cre:Tsc1flox/flox mice (βTsc1-/-) were used as WT controls (a, b). (a) Western blotting for phospho-S6 on islets from homozygous and heterozygous knockout mice and matched controls (n = 4, each sample is a pool of islets from two to four mice); (b) Western blotting and quantification of BiP expression in wild-type, Akita and Akita, βTsc1 +/- mice (n = 4, each sample is a pool of islets from two to four mice); (c) β-cell size was assessed by immunostaining for insulin and E-cadherin (n = 400–500 β-cells per group), (d) β-cell proliferation was assessed by immunostaining for insulin and Ki67 (n = 1200–1400 β−cells per group). Quantifications and representative images are shown. *p<0.05, **p<0.01, ***p<0.001, ****p<0.0001. We then tested the effects of β-cell TSC1 deficiency on the metabolic state of Akita mice after weaning. IPGTT performed at the age of 3–4 weeks showed that glucose tolerance was improved or normalized in βTsc1+/- and βTsc1-/-Akita mice (Figure 10a–b). TSC1 deficiency doubled pancreatic insulin content in control mice and increased it fivefold in Akita mice (Figure 10c–d). Islet insulin content of Akita mice crossed with the Tsc1 null was twofold higher compared to Akita islets (Figure 10e). Glucose-stimulated insulin secretion remained markedly reduced in vivo and ex vivo (Figure 10f–g), indicating that stimulation of mTORC1 improved the metabolic state by increasing β-cell mass and islet insulin content without affecting the fundamental defects in the insulin response to stimulus. Intriguingly, activation of mTORC1 in pre-diabetic Akita islets did not affect PDX-1 and NKX6.1 expression (Figure 10—figure supplement 1a–d). Collectively, these findings indicate that activation of mTORC1 improved glycemia by increasing β-cell mass and islet insulin content despite persistent ER-stress-induced β-cell dysfunction. We followed a small number of Akita mice with restored mTORC1 for 3 months. Part of the mice became mildly hyperglycemic, whereas others developed overt diabetes with severe hyperglycemia (Figure 10—figure supplement 2). Thus, life-long ER stress might eventually lead to diabetes despite the initial increase in β-cell mass with heterogeneity in the timing of appearance and severity of hyperglycemia. Effects of mTORC1 activation in neonate Akita β-cells on diabetes. (a–b) IPGTT at P30-35: glucose (1 g/kg) was injected IP after an overnight fast; (a) heterozygous Tsc1 knockout Akita mice (RIP-Cre:Tsc1flox/+:Akita (Akita, βTsc1+/-) and matched controls: Tsc1flox/+ mice (Tsc1+/+), RIP-Cre:Tsc1flox/+ mice (βTsc1+/-), and Tsc1flox/+:Akita (Akita) (n = 3–5 mice in each group); (b) homozygous Tsc1 knockout Akita mice (RIP-Cre:Tsc1flox/flox:Akita (Akita, βTsc1-/-) and matched controls: Tsc1flox/flox mice (Tsc+/+), RIP-Cre:Tsc1flox/flox mice (βTsc1-/-), and Tsc1flox/flox:Akita (Akita) (n = 3–5 in each group); (c–d) pancreatic insulin content of heterozygous and homozygous Tsc1 knockout Akita mice and matched controls at P30-35 (WT (n = 7), Akita (n = 11), Akita, βTsc1+/- (n = 3) and Akita, βTsc1-/- (n = 4); (e) islet insulin content. (f–g) Effects of mTORC1 activation in neonate Akita β-cells on insulin secretion in vivo and ex vivo. (f) insulin secretion in response to IP glucose injection (n = 6 mice in each group); (g) islets were isolated from Tsc1flox/+ WT mice (WT), Tsc1flox/+:Akita (Akita) and RIP-Cre:Tsc1flox/+:Akita (Akita, βTsc1+/-) mice and insulin secretion assessed following static incubations at basal (3.3 mmol/l) and stimulated (16.7) mmol/l glucose. (h) a model of the pathophysiology of permanent neonatal diabetes. *p<0.05 **, p<0.01, ***, p<0.001****, p<0.0001. We found that the ER stress of neonate β-cells interrupted their proliferation and cell size growth, resulting in low β-cell mass accompanied by severe insulin deficiency. The decline in β-cell proliferation along with attenuation of β-cell hypertrophy caused a ~ 70% decrease in β-cell mass together with marked depletion of islet insulin content and blunt insulin response to glucose. These deficiencies culminated in diabetes when nutrient load was increased after weaning. β-Cell growth arrest in Akita neonates was associated with transient inhibition of mTORC1. Interestingly, in adult Akita mice mTORC1 activity was increased, most probably due to hyperglycemia, and β-cell growth was resumed, albeit without ‘catch-up’ growth, hence β-cell mass remained reduced. Importantly, partial restoration of mTORC1 activity in neonate Akita β-cells was sufficient to rescue β-cell expansion with marked improvement of glucose tolerance despite ongoing ER stress and β-cell dysfunction, indicating that mTORC1 inhibition plays a key role in the pathophysiology of neonatal diabetes (Figure 10h). Our findings highlight the importance of postnatal β-cell growth and differentiation for normal glucose homeostasis in adult life. During the neonatal period, β-cells expand rapidly by proliferation, followed by hypertrophy after the transition from suckling to regular chow. These dynamics of β-cell number and size culminate in ~ 8-fold increase of β-cell mass in young adult animals, which seems to be a sine qua non condition for coping with the increased insulin demand of adult life. In our model (Akita mice) ER stress is induced by the expression of a mutant, unfoldable insulin which creates protein aggregates in the ER. Insulin is expressed at day E11.5 and therefore some degree of ER stress is expected to occur already in fetal Akita β-cells. Nevertheless, neonate Akita mice had normal β-cell mass. Also affected human subjects with Akita diabetes are born with normal body weight and are normoglycemic at birth (see accompanying paper by Balboa et al), indicating that β-cell dysfunction develops after birth. Several lines of evidence indicate that fetal and neonate β-cells respond to stress by slowing replication. A striking example is intrauterine growth retardation (IUGR), where placental insufficiency generates hypoxia and nutrient deprivation, resulting in decreased β-cell proliferation and mass in utero (Thompson et al., 2010). Infants with IUGR exhibit impaired insulin secretion and show a high incidence of T2D in adulthood (Barker, 2006). Similarly, malnutrition and low-protein diet during pregnancy restrict the number of β-cells in the fetal pancreas (Alejandro et al., 2014; Dumortier et al., 2011; Garofano et al., 1998). The Wolcott-Rallison syndrome results from mutations in PERK (EIF2AK3), leading to permanent neonatal diabetes due to β-cell ER stress. Similar to Akita mice, PERK-deficient mice exhibited severe defects in neonatal β-cell proliferation, resulting in low β-cell mass and β-cell dysfunction (Zhang et al., 2006). Most importantly, in the accompanying paper Balboa et al show that the proliferation rate of β-like cells derived from induced-pluripotent stem (iPS) cells from human subjects carrying missense INS mutations, which disrupt the proinsulin inter-chain disulphide bonds formation similar to the Akita mutation, was reduced compared to control cells in which the mutation was corrected by CRISPR. These findings strongly suggest that the proliferation inhibitory response to ER stress is a general phenomenon, and indeed relevant to disease pathophysiology in man. We performed an unbiased transcriptomic analysis in Akita neonates and studied insulin/IGF-1 signaling to clarify how ER stress induces β-cell growth arrest. Strikingly, we found that the genetic program that governs β-cell growth, including growth factor receptors (IGF-1R, IGF-2R and EGFR) and other replication genes, was downregulated. 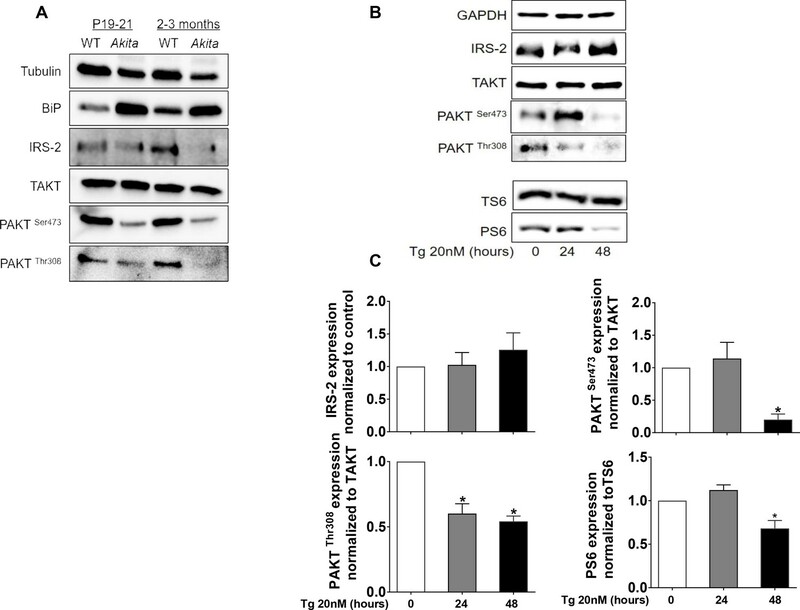 Moreover, AKT-mTORC1 signaling was vigorously suppressed. Previous reports showed that ER stress leads to suppression of insulin receptor signaling in peripheral tissues through hyperactivation of c-Jun N-terminal kinase (JNK) and subsequent serine phosphorylation of insulin receptor substrate-1 (IRS-1) (Ozcan et al., 2004). It has been recently shown that growth factor receptor bound protein 10 (GRB10), a key negative regulator of insulin, IGF1 and mTORC1 signaling is activated by ER stress via an ATF4-mediated increase in Grb10 transcription (Luo et al., 2018). Interestingly, GRB10 has been implicated in the regulation of β-cell proliferation and function (Zhang et al., 2012; Prokopenko et al., 2014). We found that in neonate Akita islets, the expression of the regulatory unit of PI3 kinase, Pik3r1 (p85α), which is essential for PI3 kinase activation by growth factors is decreased. P85α directly interacts with sXbp1 and mediates its transport to the nucleus (Winnay et al., 2014; Park et al., 2010), hence P85α may have a dual role in the regulation of insulin/IGF1-1 and UPR signaling in response to ER stress. Collectively, multiple mechanisms might be involved in the inhibition of insulin/IGF-1 signaling by ER stress. Of note, mTORC1 activity was also decreased in β-like cells derived from iPS cells from human subjects carrying the INS C96R (Akita) mutation (accompanying paper). Accumulating data suggest that mTORC1 is a master regulator of β-cell growth during early development. mTORC1 inhibition by β-cell-specific deletion of Raptor disrupts mitochondrial function, and postnatal β-cell growth and functional maturation (Ni et al., 2017), thus mimicking our findings in neonate Akita islets. S6K1 deficiency in mice results in IUGR and impairment of β-cell growth in utero (Um et al., 2015). Feeding pregnant mice with a low protein diet decreased β-cell proliferation, mass and function in the offspring in an mTORC1-dependent manner (Alejandro et al., 2014). Consistent with this ubiquitous role of mTORC1 in regulating cell size and proliferation, decreased mTORC1 activity in Akita neonate islets was associated with β-cell growth arrest. Others and we have previously shown that mTORC1 promotes ER stress, and its inhibition may prevent apoptosis under ER stress conditions (Yuan et al., 2017; Bachar et al., 2009; Bachar-Wikstrom et al., 2013; Guha et al., 2017). Therefore, mTORC1 down-regulation in neonate Akita islets can be viewed as an adaptive response aimed to alleviate ER stress and promote β-cell survival by halting anabolic, energy consuming processes. However, during early stages of development this adaptive mechanism is counter-productive, resulting in marked impairment of β-cell expansion, and consequently leads to future development of diabetes. Therefore, mTORC1 may be viewed as a double-edged sword in the context of β-cell ER stress: on one hand mTORC1 activation may promote ER stress, on the other hand its inhibition early in life impairs β-cell growth and differentiation. Interestingly, it has been recently suggested that mature tissues universally respond to cellular injury by first shutting down mTORC1, followed by its reactivation which is required for cell cycle entry and tissue repair; this process was termed paligenosis (Willet et al., 2018). In Akita mice, reactivation of mTORC1 occurred after weaning and the development of hyperglycemia when the β-cells already lost their ability to proliferate, resulting in permanent β-cell deficiency. Differentiation of Akita β-cells was impaired, evident by decreased expression of genes regulating β-cell identity and function. These changes preceded the development of overt diabetes and are most likely secondary to ER stress per se; this is in contrast with the common view that β-cell dedifferentiation in diabetes is secondary to chronic hyperglycemia (Wang et al., 2014). β-Cell transcription factors, including PDX-1 and NKX6.1 and their downstream target genes, were decreased in normoglycemic Akita neonates. PDX-1 and NKX6.1 instruct β-cell differentiation during development, but are also essential for maintaining β-cell identity and function in adult animals. The latter has also been implicated in the regulation of β-cell proliferation (Tessem et al., 2014). 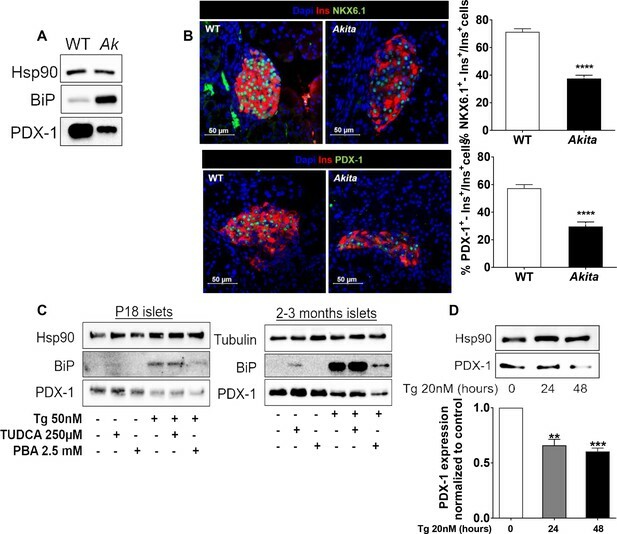 Restoration of mTORC1 activity in Akita β-cells increased β-cell expansion and ameliorated diabetes without increasing PDX-1 and NKX6.1 expression and glucose-stimulated insulin secretion, further indicating that β-cell growth arrest induced by mTORC1 inhibition plays a key role in the pathophysiology of permanent postnatal diabetes. Our findings have implications not only for the pathophysiology of rare monogenic forms of diabetes, but also for T2D. There is extreme heterogeneity in β-cell mass in healthy individuals as well as subjects with T1D and T2D, which is poorly understood (Campbell-Thompson et al., 2016; Cigliola et al., 2016). Adult β-cell mass is likely a key factor in the risk of developing T2D in the context of obesity and insulin resistance. Since β-cell proliferation is low in the adult, especially in humans, it is generally accepted that impaired β-cell proliferation plays a minor role in the pathophysiology of diabetes. However, genome-wide association studies do point to the importance of β-cell proliferation as a determinant of T2D (Thomsen et al., 2016). β-Cell expansion during the fetal and early neonatal period is extensive, and therefore impairment of β-cell proliferation during these early developmental stages will strongly impact the ultimate β-cell mass and function. Our data, although emanating from a neonatal diabetes model can be relevant also to other forms of diabetes, for example T2D in which interplay of genetics (variants in cell cycle genes) and environmental factors like viral infections, nutritional stressors or noxious chemicals during the early postnatal period, may induce silent but detrimental effects on β-cell mass via the ER stress-mTOR pathway, predisposing to diabetes in adulthood. Mouse strains used included RIP-Cre (Gannon et al., 2000), Rosa26-LSL-Yfp (Srinivas et al., 2001), Akita (Ins2WT/C96Y) (The Jackson Laboratory), Tsc1fl/fl (a kind gift from Dr. B. Tirosh, The Hebrew University, Jerusalem). The genetic background of the Tsc1fl/fl mice is 129S4/SvJae strain. Ins2C96Y Akita and the RIP-Cre mice were generated on the background of C57BL/6J mice. The Rosa26-LSL-Yfp mice are a mixture of the 129 × 1/SvJ and of C57BL/6J as previously described (Srinivas et al., 2001). Akita males were selectively chosen for all analyses, since they develop a more severe form of diabetes compared to females. Mice were housed under similar conditions with 12 hr light/dark cycles with free access to food and water at The Hebrew University animal care unit. For assessment of glucose tolerance, mice fasted for 16 hr or 4 hr were given 1.0 or 1.5 g/kg glucose IP followed by consecutive blood glucose measurements. Tail blood glucose was monitored using an Accuchek glucometer (Roche Diagnostics GmbH, Mannheim, Germany). For measurement of serum insulin blood samples were collected either from the tail or from the facial vein using heparin coated capillaries or tubes at the start and 15 min after glucose injection. Plasma samples were analyzed using ultrasensitive insulin kits (Mercodia, Uppsala, Sweden and Crystal Chem Inc., IL). Pancreatic insulin content was analyzed in whole pancreas extracts. Pancreases were isolated, homogenized and insulin was extracted overnight in acid ethanol at 4˚C. Insulin content was determined by an ELISA kit (Mercodia). Animal use was approved by the Institutional Animal Care and Use Committee of the Hebrew University. The rat insulinoma cell line INS-1E was kindly provided by Prof. M. Walker (The Weizmann Institute of Science, Rehovot, Israel) and grown as previously described (Luo et al., 2018). Mycoplasma contamination was examined periodically and the tests showed no evidence for contamination. Functionality of the cell line was validated by checking periodically their glucose stimulated insulin secretion. Islets were isolated by ductal perfusion of collagenase P (Roche). Hand-picked islets were plated for overnight recovery in RPMI-1640 medium containing 11.1 mmol/l glucose (Biological Industries) supplemented with 10% FBS, L-glutamine and penicillin-streptomycin in a 37°C, 5% CO2 incubator before experimental procedures. For static glucose-stimulated insulin secretion tests, batches of 25 islets in triplicates or quadruplicates were pre-incubated for 60 min in RPMI-1640 containing 3.3 mmol/l glucose, then consecutively incubated at 3.3 mmol/l and 16.7 mmol/l glucose for 1 hr at 37°C in 200 µl modified Krebs-Ringer bicarbonate buffer containing 20 mmol/l HEPES and 0.25% BSA (KRBH-BSA). Medium was collected, centrifuged, and frozen at −20°C and islets were lysed using 0.1% BSA-GB/NP-40. Insulin in medium and islet lysates was determined by ELISA. Pancreases were fixed with zinc-formalin (neonates) or 4% buffered formaldehyde (weaning and adults) for 3 hr. Paraffin sections (5 µm thick) were rehydrated and antigen retrieval was performed using a Biocare pressure cooker and citrate buffer (pH = 6). The following antibodies were used: guinea pig anti-insulin 1:200 (DakoCytomation, Glostrup, Denmark), rabbit anti-Ki67 1:200 (Thermo Scientific, Kalamazoo, MI), goat anti PDX-1 1:200 (kindly provided by Dr. C. V. Wright, Vanderbilt University, TN), mouse anti-NKX6.1 1:200 (Developmental Studies Hybridoma Bank), PS6 (Cell Signaling, MA), mouse anti E-cadherin 1:100 (BD Bioscences, NJ), mouse anti PCNA 1:500 (DakoCytomation, Glostrup, Denmark) rabbit anti H3P 1:100 (Cell Signaling, MA). TUNEL staining was performed with the Roche Cell Death Detection Kit (Roche Diagnostics), cell nuclei were visualized with DAPI staining. Secondary antibodies are all from Jackson Immuno Research Laboratories. Digital images of pancreatic islets were obtained with a Zeiss LSM-710 and Nikon A1R confocal microscope using a x40 oil objective. For analysis of β-cell proliferation and apoptosis, β-cells were counted using Adobe Photoshop CS6 software. To determine β-cell mass, consecutive paraffin sections 75 µm (in young and adult mice) or 50 µm (in newborns) apart spanning the entire pancreas were stained for insulin and hematoxylin. Digital images were obtained at an original magnification of × 4 with a Nikon C1 confocal microscope, stitched using NIS-Elements software (Nikon, Melville, NY), and the percent area covered by insulin was determined. β-Cell mass was calculated as the product of pancreas weight and percentage insulin area. Protein levels were assessed using antibodies against: total and phospho S6 ribosomal protein (Ser240/244), insulin receptor substrate 2 (IRS2), total and phospho-AKT/protein kinase B (Ser473 and Thr 308), phospho-4EBP-1(Thr37/46), BiP, PDX-1, tubulin, and Hsp90. Peroxidase-conjugated AffiniPure goat anti-rabbit, anti-chicken and anti-mouse IgG from Jackson ImmunoResearch Laboratories (West Grove, PA) were used as secondary antibodies. RNA was extracted using TRI Reagent (Biolab, Jerusalem, Israel) and an RNeasy Micro Kit (Qiagen); samples of 260 ng total RNA were reverse transcribed using a high capacity cDNA Reverse Transcription Kit (qScript, Quantabio, Beverly, MA). Quantitative real-time RT-PCR for total and spliced Xbp1 was performed on a Prism 7000 Sequence Detection System using the Power SYBR Green PCR Master Mix (Applied Biosystems, Foster City, CA). All samples were corrected for glyceraldehyde-3-phosphate dehydrogenase. The following oligonucleotides were used for the PCR of total and spliced Xbp1: forward T-Xbp1, 5'- AAGAACACGCTTGGGAAT-3' and reverse t-Xbp1: 5'- ACTCCCCTTGGCCTCCAC-3; forward s-Xbp1: 5′-GAGTCCGCAGCAGGTG-3′ and reverse s-Xbp1: 5′- GTGTCAGAGTCCATGGGA-3′. RNA sequencing libraries were constructed from 120 ng of total RNA using the TruSeq RNA V2 sample prep kit (Illumina). Single read sequencing was performed on Illumina hiSeq2500 to 50 bp. Reads were aligned to the mouse genome GRCm38 using STAR (v2.5.2b). Quantification of read counts per gene was performed using htseq-count (version 0.7.2) and differentially expressed genes were identified using DESeq2 package (version 1.12.4) for normalization and evaluation of differential expression. The significance threshold for comparisons was taken as p value < 0.05. Gene set enrichment analyses were done using Genomica (http://www.genomespace.org) and GSEA (http://software.broadinstitute.org/gsea/index.jsp) and pathway analyses were carried out using the software Ingenuity Pathway Analysis (IPA; Ingenuity Systems, http://www.ingenuity.com). Statistical analysis was performed using GraphPad Prism 6.01 software (GraphPad Software, La Jolla, CA). Differences between multiple groups were analyzed by one-way ANOVA. Two-tailed paired Student’s t test was used to compare differences between two groups. One-sample Student’s t test was performed to validate statistical differences in experiments expressing data as relative to control. Data in graphs and tables are presented as means ±SEM (standard error of the mean). p<0.05 was considered significant. Diabetes, Obesity and Metabolism 12:1–3. Journal of Clinical Investigation 124:4395–4410. Clinical Obstetrics and Gynecology 49:270–283. Upsala Journal of Medical Sciences 121:155–158. Nature Clinical Practice Endocrinology & Metabolism 3:758–768. Diabetes, Obesity and Metabolism 18:87–96. The American Journal of Pathology 178:2632–2640. Journal of Clinical Investigation 101:2112–2118. Journal of Biological Chemistry 281:2649–2653. Journal of Molecular Endocrinology 60:285–297. Journal of Clinical Investigation 109:525–532. Diabetes, Obesity and Metabolism 10:32–42. Type 2 diabetes-a matter of beta-cell life and death? Cellular and Molecular Life Sciences 70:1575–1595. Journal of Clinical Investigation 125:3831–3846. Molecular and Cellular Biology 28:2971–2979. Journal of Biological Chemistry 285:15111–15118. The Journal of clinical investigation 125:2736–2747. Thank you for submitting your article "Inhibition of mTORC1 by ER stress impairs neonatal β-cell expansion and predisposes to diabetes" for consideration by eLife. Your article has been reviewed by two peer reviewers, and the evaluation has been overseen by a Reviewing Editor and Harry Dietz as the Senior Editor. The reviewers have opted to remain anonymous. This manuscript from Riahi and co-authors describes an elegant study, which has unfortunately been hastily written up, that examines the mechanism of the β-cell mass deficit in male mice carrying the Ins2C96Y mutation on a B6 background (referred to in this paper as simply Akita mice) in a detailed and careful manner and suggest that mTORC1 may modify the phenotype. The authors clearly show an important role for a profound β-cell proliferation defect in young Akita mice. They also evaluate cell size and β-cell function. The authors identify a loss of mTORC1 signaling as a critical mechanism blocking proliferation. Using a negative regulator of mTORC1, Tsc1, they are able to dissect the components of the phenotype that are mTORC1-dependent. This is an important study that adds to a growing body of literature defining pathogenically relevant links between β-cell stress and failure of adaptive expansion and maturation. 1) The reviewers and editors have concerns regarding the small group sizes which have been used for many studies (n=3) and the potential effect of "outliers". The authors should increase the number of mice studied and ensure that all data points are shown. 2) The authors also fast mice for 16h before glucose tolerance testing which leads to a catabolic state and weight loss (Ayala et al., 2010). 4-6 hours is much better. The authors must justify the decision to fast the mice for this prolonged period. 3) These authors suggest that the effect of insulin mutations in this mouse model are on postnatal development/function of β-cells whereas the accompanying paper by Balboa et al. in a human model suggest probably prenatal. It is not clear if this reflects a difference between mice and men or something else. 4) The current work leaves open some key questions, including the mechanisms linking ER stress to changes in maturation. Exactly how do the authors propose mTORC1 is controlled by ER-stress in their model? This should be discussed in more detail, perhaps drawing on the signalling networks that can be constructed from open data. We performed additional experiments and increased the n as detailed below: in Figure 1—figure supplement 3A, we added blood glucose values that were recorded in WT and Akita newborns: the number of samples was increased from 3 to 8 in the wildtype group and to 7 in the Akita group. In Figure 1—figure supplement 3B, we analyzed β-cell mass in 2 additional newborn (P1-2) Akita and wildtype mice; we now have n=5 in each group (Figure 3E and Figure 1—figure supplement 3B were updated). The numbers of animals and cells used for quantifications were added in the legend to all figures. In Figure 5, we increased the number of mice used for the quantification of phosphorylated S6 (n=4-6 mice in each group). In addition, in Figure 5—figure supplement 2, we performed additional experiments and increased the number of TUDCA treated and control mice; the revised manuscript shows the results of n=4-6 mice in each group. In Figure 3, the number of experiments indicated in the legend remained from a previous version of the manuscript and was incorrect. The correct number (n=6) is shown in the revised manuscript. In Western blotting and RNA-seq experiments, analyses were performed on pools of 400-600 islets from many wildtype and Akita mice in each experiment, therefore the results represent the mean of multiple animals of each strain. In light of this comment, we performed an experiment in which IPGTT was performed in the same animals after 4 and 16 h fast in wildtype and in Akita mice. The findings are shown in Author response image 1. Note that at 16h, fasting blood glucose of wildtype mice is lower than that at 4h (81 compared to 156.5 mg/dl), indicating that at 4h glucose is not at steady-state. Moreover, at 4h glucose excursion following IP glucose injection is small, therefore it is difficult to assess glucose disposal. In addition, in Akita mice, fasting blood glucose at 4h is much higher than in wildtype mice, therefore it is difficult to compare the glucose response between diabetic and non-diabetic animals. Moreover, in diabetic animals blood glucose levels were >600 mg/dl (above the detection limit of the glucometer), thus the animals are exposed to extreme hyperglycemia. Overall, we believe that these findings suggest that in our model, overnight fast is superior to 4h for the assessment of the glucose response. Effects of 4 and 16h fast on IPGTT. Wildtype (WT) and Akita mice were fasted for 4 or 16h followed by IPGTT (1.5 gr/kg glucose) (n=4 in each group). We believe that the differences are explained by using different experimental systems. In vitro differentiation of iPS cells is a complex process, which may not completely overlap pre- and postnatal differentiation in vivo. The stages of iPS differentiation to β-cells have similarities with β-cell differentiation in vivo; however there might be cellular heterogeneity in the differentiation state at a given time point. Humans with neonatal diabetes due to insulin mutations are born with normal body weight and are normoglycemic at birth, indicating that hypoinsulinemia and most probably the decrease in β-cell mass develops during the postnatal period, therefore it is unlikely that the apparent dissimilarities reflect a difference between mice and men. Our data indicate that ER stress inhibits mTORC1 through inhibition of insulin/IGF-1 signaling at the level of PI3 kinase-Akt (see Figure 5—figure supplement 1). We found that ER stress induced by the Akita proinsulin mutant or by treatment with thapsigargin had modest or no effect on IRS2 expression, while markedly inhibiting Akt phosphorylation at Serine 473 and Threonine 308 that are both required for its activity. Our preliminary data show that the expression of P85α, an important component of the PI3 kinase which is required to its activity, is decreased. We are currently performing in depth study on how different types of ER stress affect P85α mRNA and protein level and subcellular localization. These extensive studies are ongoing; at this stage they are too premature to be included in the manuscript. We extended the discussion on possible mechanisms leading to inhibition of Akt-mTORC1 signaling based on the literature. Ayala, J.E., Samuel, V.T., Morton, G.J., Obici, S., Croniger, C.M., Shulman, G.I., Wasserman, D.H., McGuinness, O.P. (2010). Standard operating procedures for describing and performing metabolic tests of glucose homeostasis in mice. Disease Models & Mechanisms, 3: 525-534; doi: 10.1242/dmm.006239. Animal experimentation: This study was performed in strict accordance with the recommendations in the Guide for the Care and Use of Laboratory Animals of the Hebrew University. All of the animals were handled according to approved institutional animal care and use committee of the Hebrew University. The protocol was approved by the Committee on the Ethics of Animal Experiments of the Hebrew University (Permit Number: MD-17-15065-4). Every effort was made to minimize animal suffering. © 2018, Riahi et al. Insulin gene mutations are a leading cause of neonatal diabetes. They can lead to proinsulin misfolding and its retention in endoplasmic reticulum (ER). This results in increased ER-stress suggested to trigger beta-cell apoptosis. In humans, the mechanisms underlying beta-cell failure remain unclear. Here we show that misfolded proinsulin impairs developing beta-cell proliferation without increasing apoptosis. We generated induced pluripotent stem cells (iPSCs) from people carrying insulin (INS) mutations, engineered isogenic CRISPR-Cas9 mutation-corrected lines and differentiated them to beta-like cells. Single-cell RNA-sequencing analysis showed increased ER-stress and reduced proliferation in INS-mutant beta-like cells compared with corrected controls. Upon transplantation into mice, INS-mutant grafts presented reduced insulin secretion and aggravated ER-stress. Cell size, mTORC1 signaling, and respiratory chain subunits expression were all reduced in INS-mutant beta-like cells, yet apoptosis was not increased at any stage. Our results demonstrate that neonatal diabetes-associated INS-mutations lead to defective beta-cell mass expansion, contributing to diabetes development.